If we are slaves to the numbers and we want those numbers to be really big, or at least bigger than last time. More butts in seats means “success”. This clearly isn’t right. We know it’s not right, but if we are not careful we can lean this way all too easily. The right way is messy. The right way doesn’t always give us twitter-worthy number punchlines. 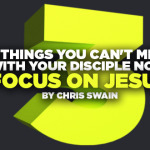 But the right way is to focus on Jesus, teach the Great Commission, and be a church that celebrates what God is doing even when the numbers don’t look amazing. If we see our services and events as the highest level of discipleship. Church attendance is critical for every Christ follower. Joining a local body of believers is absolutely a must in order to grow and strengthen our faith. Hebrews 10:25 is pretty clear on the issue and I know of very few who would say otherwise. But our church services and events are not the pinnacle of one’s relationship with Jesus. That happens one-on-one between believer and Christ. If we see inviting people to church the same as leading people to Jesus. If we aren’t careful we can spend more of our attention and focus on encouraging our people to invite others to church rather than equipping them to invite others to Jesus. Only Jesus can raise the dead to life, renew a person, and transform that life eternally. Because we want them to connect with biblical community, to worship together, study together, sing, give, serve, and other various connecting-type things. The church is the bride of Christ. It is not to be messed with, minimized, put down, ignored, underrated, or negated. We ought to love the Church as Christ loves the Church. We know that there are so many things that the Church can do, and biblical community is one that it does best. Church is a hub for spiritual growth and we want people to engage in that. Because we understand that people will probably get an invitation to follow Jesus through the sermon, study, or general community environment. While inviting someone to church isn’t the same as inviting them to Jesus, they will certainly have a hard time missing Him at a gospel-centered church. Because we truly believe that what we have in store will impact their life for the sake of the gospel to help them grow, rest, learn, gain passion, and strengthen their walk with Jesus. Our heart is always in the right place when we seek to find creative and Christ-honoring ways to engage with the King. God gives us creativity and skill for the purpose of bringing Him glory, and it shines bright when the ability and the purpose synergize for His name’s sake. I once heard a pastor say, “I have a never seen an empty seat get saved.” I agree with that. We ought to invite people with the intention of them hearing the gospel. If I had it my way, every gospel-centered church in the world would be at max capacity every time they opened the doors. The problem begins when we count filled seats as successful ministry. We must bridge the gap between getting people to our services and reaching people with the gospel. We must be more intentional about presenting the gospel than we are about presenting our services and events. Numbers aren’t the enemy but they shouldn’t be our highest goal either. I know, I know, “Numbers equal people” and “Every number represents a person.” Yes, I get that. I also personally love numbers. I believe they are one of the clearest ways to measure actions and strategies. But we must measure our motives as well. Our desire to hear about our people leading others to Jesus should outweigh our desire to see them invite people to an event, even if that event is church. When the two work toward the same end, the church is at its best. When we lose balance, the results don’t honor Jesus. So before we encourage our people to invite a friend to our latest and greatest service, event, project, theme night, Bible study, or discipleship initiative, let’s teach them to invite people first to Jesus. If that happens, the other stuff will follow. Our churches will be so full we won’t know what to do. We will be left praising and worshiping God for His great work. And that’s the way it should be.